Medical devices are getting smaller, less invasive, and more advanced, an expert tells MD+DI. Read on for the latest details on trends, materials, and manufacturing. MD+DI has been tracking miniaturization for some time, as we’ve seen trends deepen in minimally invasive surgeries, wearable devices, advanced drug delivery, and more. Lindsay Mann, director of marketing for MTD Micro Molding, tells MD+DI that about 25% of the micro medical device components they produce are for miniaturized devices. We asked her for an update on miniaturization, including recent advancements in materials and manufacturing. What is driving the current trend toward medical device miniaturization? Mann: As less invasive procedures and technology-driven advancements become more prevalent, the demand increases for smaller yet more effective and powerful medical components that benefit patients and the medical profession alike. These miniaturized devices can be made possible by micro injection molding—creating optimized micro medical products by making smaller plastic parts with higher precision, more complex features, and with different materials. Pediatric applications requiring smaller versions of the adult versions. Point-of-care technologies for patient care and comfort, such as wearable devices to manage chronic pain (e.g., at-home dialysis, wearable bolus injectors). Minimally invasive surgeries (vs. larger-scale surgical operations), such as laparoscopic or endoscopic procedures. Office-based outpatient surgical procedures (vs. hospital-based services). Pairing with medtech advancements, such as optical imaging, robotics, and computer processing. How does a company know its product or idea is a candidate for miniaturization? Mann: Any plastic part can be miniaturized, with some being more challenging to manufacture than others based on complexity and geometry of the design. We advise clients who are miniaturizing their design to focus on the most critical areas of the design and understand some features may need to be changed or eliminated to allow for successful manufacturability at such a small scale and to avoid excess cost and lead time. Selecting a strategic partner for manufacturing a miniaturized version of a product is extremely important and can sometimes be a difficult journey for medical device companies. What is the smallest device currently possible? Mann: Micromolded parts can be as small as microscopic in size. In terms of weight, we manufactured a part where 520 parts were made from a pellet of polycarbonate. The smallest part we have molded was an ophthalmic implant that weighed in at 0.00000313 grams (about 1,000 times smaller than a sesame seed). 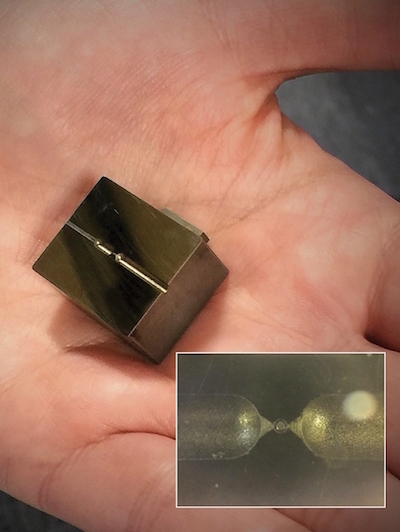 What manufacturing and engineering advances now make miniaturization possible? 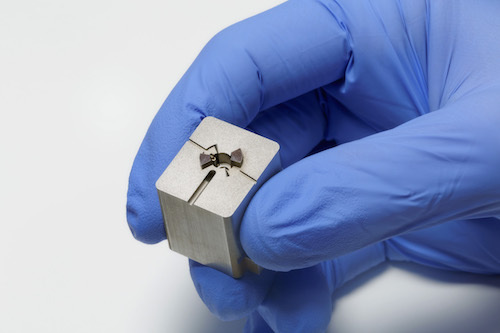 Mann: Advancements in high-precision mold making and molding technology allow for more possibilities when miniaturizing medical device components. Advanced and highly accurate molding equipment and molding automation are essential when working with such small component sizes and micro features. Precise miniature plastic parts are the result of exact tooling execution. Our workpiece accuracy target is 42 millionths of an inch. Workpiece accuracy refers to what the actual part comes out of the machine looking like, and not what the machine is specified to do. Our Sarix 3D EDM milling machine is a very unique piece of equipment that creates cavity geometry by following a tool path similar to CNC milling, but the major difference is that the end mill is actually an electrode that can be as small as 5 microns. New improvements in cutting tools for milling equipment provides more advancements in geometries and coatings. We have recently acquired a new EDM machine that lets machining operators use ultra-small wire in the range of 0.0008 in. to 0.001 in., which opens the doors and possibilities to the type of micromachining applications that can be developed to create superior tooling to support the micromolding of today’s leading-edge micro medical products. Are there any material challenges or limitations when developing miniature components? If so, how can they be overcome? Mann: PEEK is a popular material choice for medical devices because of the implant data that accompanies it, and it is one of the easiest materials to machine, which makes it convenient for the prototyping phase. The problem with PEEK, however, occurs when higher production volumes justify moving into the injection molding process for significant cost savings. The benefit is that micro injection molding takes a fraction of the time to mold components and uses less costly materials in comparison to micromachining. The issue is that micro injection molding with PEEK can be challenging, placing further stress on timing and budget. Bioabsorbable materials are being used more often in medical micromolded applications and offer big advantages for medical science and patients alike by allowing an implant to be absorbed by the human body. However, these advanced polymers can be quite expensive and present many challenges to micromolders. These materials also require proper handling before, during, and after molding in order to maintain the properties of the polymer. How much of the miniaturized devices now on the market are made of bioabsorbable materials? Are there any challenges in working with such materials? Mann: Bioabsorbable materials are a popular material choice for certain applications in the medical device industry. These materials lend themselves well to products in the fixation, wound closure, ENT, and drug-delivery markets. These are challenging materials to work with on a small scale and a successful bioabsorbable micromolding project with result in parts with superior post-mold mechanical and functional properties, highly capable critical dimensions, and consistent and minimal post-mold IV loss. Robust validation processes, in-house testing, runner optimization tools, critical handling, storage, packaging, and shipping procedures, as well as specialized micromolding equipment are some of the keys to overcoming the challenges of micromolding bioabsorbable materials. Are there any common pitfalls in designing, engineering, and manufacturing miniaturized devices? How can they be overcome? Mann: When trying to produce an innovative micro medical design, designers and engineers may come to a roadblock. What can you do to move forward and get the project back on track? First, determine the source of the problem. Is your supplier having problems? Is there an issue with your design? Most pitfalls and roadblocks can be overcome by fully understanding the edges of success and failure for your design, knowing what specific technology expertise is required to bring your design to life, and consulting your selected molder early in the process. Are smart manufacturing, robotics, AI, 3D printing, or other novel approaches involved in developing and manufacturing miniaturized devices? Mann: Robotics and automation play a big part in successful micro injection molding. We continue to see “smarter” camera systems and robotics. We do utilize 3D printing to support our custom molding automation. We plan to see 3D printing make advancements that can provide useful tools for micro manufacturers to assist customers in proving out their designs quickly, with high accuracy. Is it possible to produce miniaturized multiple-component devices? If so, how do you handle assembly? Mann: Overmolding multiple components into one solid piece with advanced micromolding prevents costly and time-consuming secondary operations and assembly steps. When assembly is required for micro sized plastic parts, handling of these delicate and tiny devices is performed with high powered microscopes and precise, custom-made fixtures are utilized. Are miniaturized devices handled differently in terms of sterilization, packaging, logistics, storage, etc? During the pre-molding phase, critical drying procedures and controlled storage of materials are required. During the molding phase, understanding the thermal stability of polymers due to high residence time during micromolding process is critical to avoid premature degradation, discoloration of polymer. 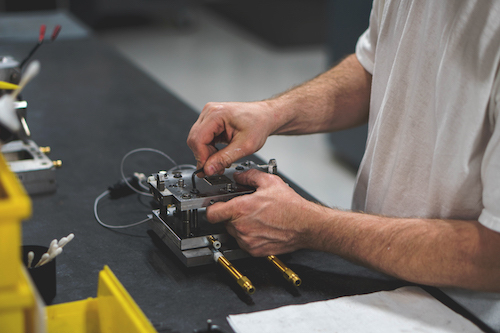 During post-molding phase, custom grippers on EOAT (end-of-arm-tooling) are required for part handling upon mold ejection utilized to ensure no damage to parts during ejection and to protect delicate features for transit with custom trays and packaging systems. Climate-controlled component storage is also essential post-molding. When devices are so small, how do you inspect and test to ensure quality? Mann: Along with inline camera systems in our presses checking the geometry of each part, parts are be inspected in custom fixturing with touch-free optical vision systems. Our QC lab utilizes OGP measurement systems for high-accuracy metrology. We also partner with a company that provides us with CT scanning services for accurate, high-resolution measurements as well. This is an excellent tool to capture internal dimensions of a part that otherwise would require manual cross-sectioning to measure. How are bioabsorbable devices tested? Mann: MTD has the in-house capability for real-time, continuous inherent viscosity (IV) and differential scanning calorimetry (DSC) testing for bioabsorbable materials and molded parts. This allows us to monitor, optimize, and report IV loss throughout the development and validation processes of a product as well as verify post-mold IV to release every production lot to the customer. How has MTD Micro Molding seen medical device miniaturization change since it first produced such products? What will the next decade hold? Mann: The medical segment of the micro injection molding market continues to grow year after year, and with products continuing to get smaller, less invasive, and more advanced, the expectation is that this segment will continue to grow. This will breed advancements in technology to bring these types of products to life quickly and accurately. remains a cost-effective solution for highly precise and consistent manufacturing of plastic components. More bioabsorbable products entering the medical market and new materials will be introduced by material manufacturers to provide more options to designs for creating products with optimal properties for various medical applications. And be sure to visit MTD Micro Molding at Booth #1115 at MD&M Minneapolis October 31-November 1.